A black hole has been "beating" about every 5 to 10 million years, pumping material and energy into its environment. This black hole is at the center of a large elliptical galaxy located within the core of the Centaurus Cluster of galaxies. Data from Chandra and other telescopes show evidence for repeated bursts, or eruptions, from the black hole. These bursts created cavities within the hot, X-ray emitting gas that pervades the cluster. 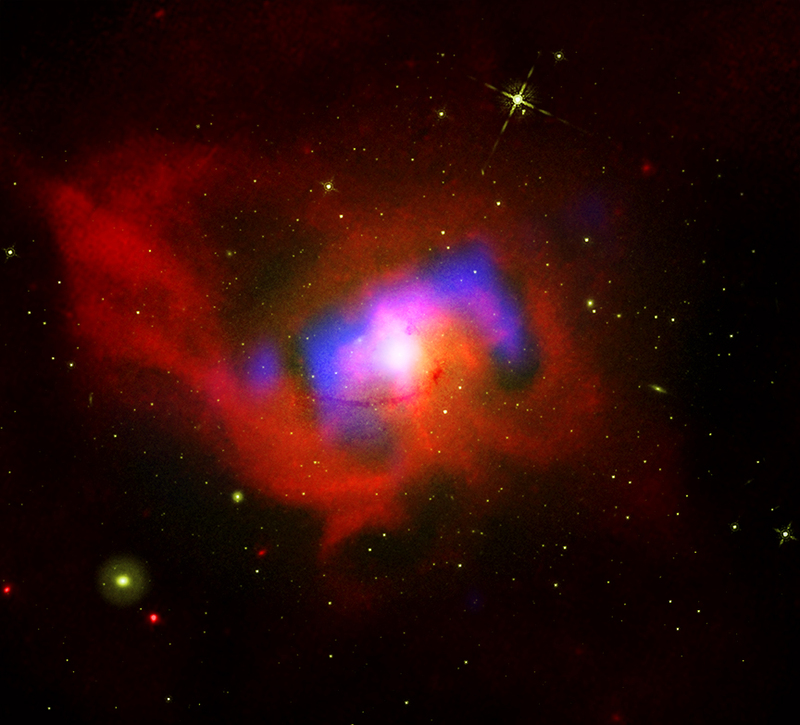 This composite image contains X-ray data from Chandra (red) that reveals the hot gas in the cluster, and radio data from the NSF's Karl G. Jansky Very Large Array (blue) that shows high-energy particles produced by the black hole-powered jets. Visible light data from the Hubble Space Telescope (green) show galaxies in the cluster as well as galaxies and stars outside the cluster. Cavity processing scale: This image shows a larger field of view than the main composite image above and is about 122,000 light years across. 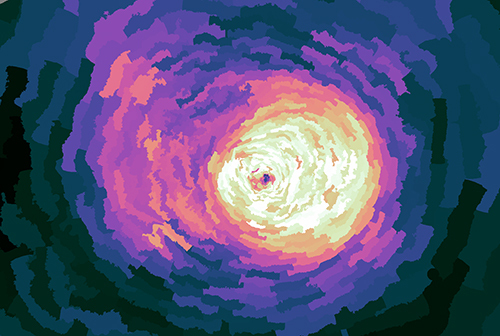 This image has also been rotated slightly clockwise to the main composite image above. 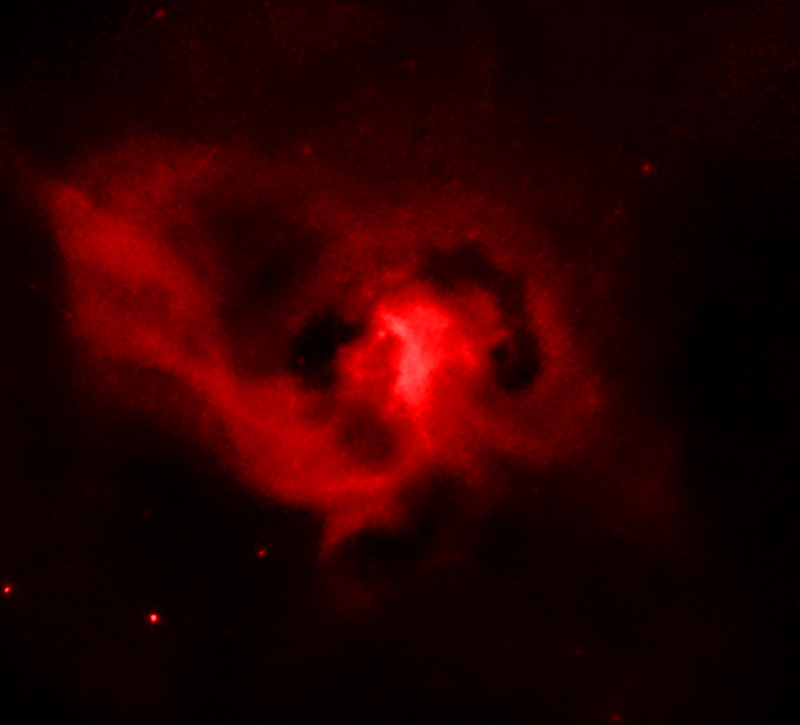 Astronomers employed special processing to the X-ray data (shown above) to emphasize nine cavities visible in the hot gas. 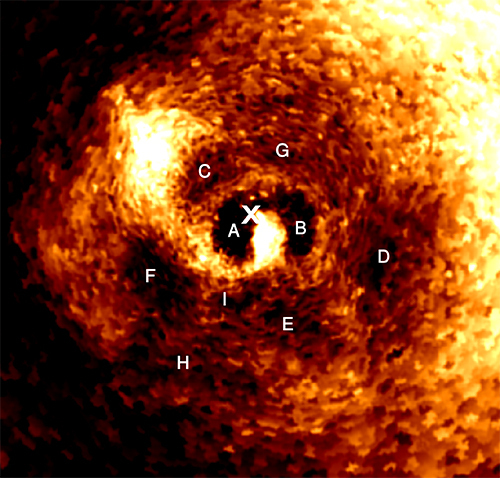 These cavities are labeled A through I in an additional image, and the location of the black hole is labeled with a cross. The cavities that formed most recently are located nearest to the black hole, in particular the ones labeled A and B. The researchers estimate that these black hole bursts, or "beats", have occurred every five to ten million years. Besides the vastly differing time scales, these beats also differ from typical human heartbeats in not occurring at particularly regular intervals. Curved processing scale: This image also shows a larger field of view than the main composite image and is about 550,000 light years across. This image has also been rotated slightly clockwise to the main composite image. The black hole bursts also appear to have lifted up gas that has been enriched in elements generated in supernova explosions. The authors of the study of the Centaurus cluster created a map (shown above) showing the density of elements heavier than hydrogen and helium. The brighter colors in the map show regions with the highest density of heavy elements and the darker colors show regions with a lower density of heavy elements. Therefore, regions with the highest density of heavy elements are located to the right of the black hole. A lower density of heavy elements near the black hole is consistent with the idea that enriched gas has been lifted out of the cluster's center by bursting activity associated with the black hole. The energy produced by the black hole is also able to prevent the huge reservoir of hot gas from cooling. This has prevented large numbers of stars from forming in the gas. Coordinates (J2000) RA 12h 48m 48.90s | Dec -41° 18´ 44.40"
Cheryl, its not the absence of a heartbeat. It only means it's not rhythmic. Arrhythmia is actually the absence of a heartbeat. Your article is contradicted by it's title. But, fascinating, really great information here... Beautiful imagery. How can things "erupt" from a black hole? I thought it drew everything in towards it and that even light can't escape so how is this possible? I assume that the escaping particles can't travel faster than the speed of light of course. A black hole in the center of NGC 4696. About 145 million light years from Earth. Combines X-rays from Chandra X-ray Observatory and optical/radio data from other telescopes. About 93,000 light years across. X-rays are red. Optical is green. Radio is blue.